Any real inspection of the family tree of Henry VII really needs to begin with a look at the lady that sits at the head of it all. This would be Margaret Beaufort. A descendant of King Edward III she was the mother of Henry Tudor that later became King Henry VII at the tender age of thirteen. Henry VII came to the throne while the two sides of the royal family, those of York and Lancaster fought over who should rightfully sit on the throne. Upon the death of Henry’s father, he was taken by his uncle to Brittany, France where his safety could be assured until he was able to return to England. Henry was able to return from exile in August of 1485 and became the first of the Tudor Dynasty to rule England. Henry was the only son of Margaret Beaufort and Edmund Tudor, and until he became king carried the title of Earl of Richmond. Research into Henry VII family tree shows that he was born at Pembroke Castle in Wales in January 1457. He was declared to be King Henry VII following the death of King Richard III at the Battle of Bosworth Field during the War of the Roses; that being the name given to the York and Lancaster houses. In January 1486 he was married to Elizabeth Plantagenet and between them, they brought forth eight children. These were Arthur, Prince of Wales in 1486; Margaret in 1489; Henry (VIII) in 1491; Elizabeth in 1495 (died in 1495); Mary in 1496; Edmund, Duke of Somerset in 1499 (died 1500); Edward (date unknown), Katherine (born sleeping in 1503). Of the eight four are known to have survived childhood. Henry VII Died in 1509 and is buried inside Westminster Abbey. 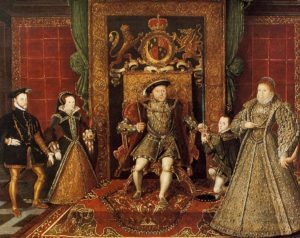 Despite the number of marriages and subsequent pregnancies that followed, Henry VIII family tree is relatively short. His elder brother Prince Arthur of Wales was married to Catherine of Aragon in 1501. Arthur contracted ‘sweating sickness’ and died in 1502, making Henry the next lawful heir to the throne of England. Henry’s elder sister Margaret Tudor married James IV of Scotland and became the Scottish Queen. Margaret and James went on to have six children, one of which went on to become King James V. Henry, Duke of York was crowned King Henry VIII in 1509. His first marriage to his brother’s widow Catherine of Aragon saw the birth of six children, the only one that survived to be Mary who was born in 1516. His second marriage to Anne Boleyn produced three children the one that survived to be Elizabeth. The third marriage to Jane Seymour produced Edward the future king while his subsequent marriages to Anne of Cleves, Catherine Howard and Catherine Parr produced no children. 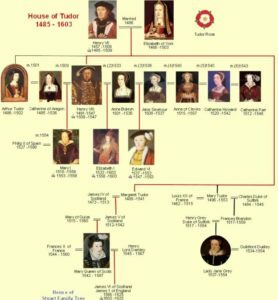 Henry’s family tree and that of the Tudor Dynasty effectively came to an end with the death of his youngest daughter Queen Elizabeth I in 1603. She died unmarried and childless, providing no true Tudor heir to the throne.